Synopsis This story is about Chinese tradition. When two sides fight, it's always the third party that benefits. 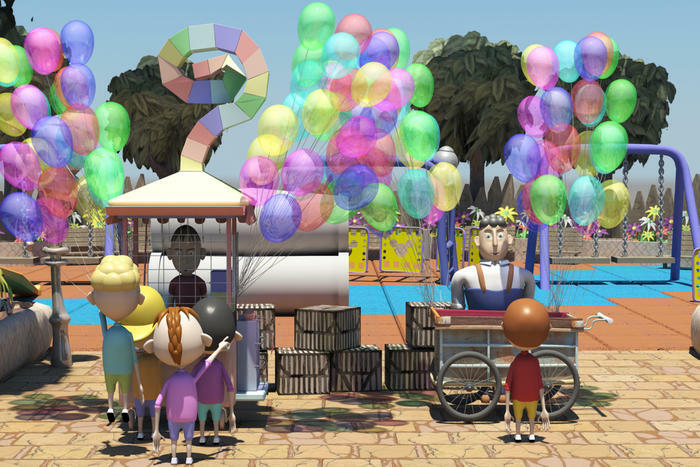 In the beginning, there were two vendors selling balloons in a park. One day, another vendor went to the park. In order to attract the customers, two of the vendors pumped all their balloons larger and larger. However, because of their greed, all of their balloons were burst. Finally, there was only one vendor selling balloons, and all tourists went to patronize him. 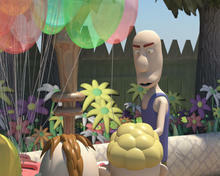 Hello, I am Wong Wai Choi, a 15-years-old boy who has learnt 3D animation for three year. I am a form three student from Shun Tak Fraternal Association Yung Yau College. I used the software called Maya to create 'Balloon'. It is really a big challenge for me. Luckily, I got the help from the teachers and upper form students. I hope I can sharpen my skills in this field, so that I can learn more and produce better movie clips in the future. I am Yeung Yiu Wing. I am 14-years-old, a form three student from Shun Tak Fraternal Association Yung Yau College. I have learnt to use Maya from three years ago. I used Maya to make 'Balloon'. It is one of the difficulties for me in the 3D animation studying. I hope I can learn more about this software so that I can produce more movie clips with higher quality in the future. — Shared by Wong Wai-choi, director of Balloon, after attending the 8th International Youth Media Summit in Serbia, under the sponsorship of NAE. — Shared by Yeung Yiu-wing, director of Balloon, after attending the 15th Seoul International Youth Film Festival, under the sponsorship of NAE.